SEB’s Swedish Housing Price Indicator declined slightly to 67 in April, just slightly below to the record level of 68, reached last month. According to the survey, 77 per cent of Swedish households expect home prices to be higher in 12 months' time while only 10 per cent foresee declining prices. The results reflect rising expectations in all regions except the south where the indicator fell back to 48 after a temporary spike to 69 in March. The share of households that plan to fix rates in 3 months increased marginally to 7 per cent, from 6 per cent in March. The levels are still low compared to historical peaks, which most often have coincided with periods when the Riksbank have initiated rate hike cycles. There are thus few signs that low yields are yet causing households to shift towards a larger share of fixed rates. Swedish households' own repo rate expectations declined from last month but households still expect the repo rate to rise from current -0.25% to 0.38% (March 0.39%) in a year’s time. In line with the signals from SEB’s Housing Price Indicator home prices have continued to accelerate with home prices according to Valueguard now increasing well above 10 per cent on annual basis. 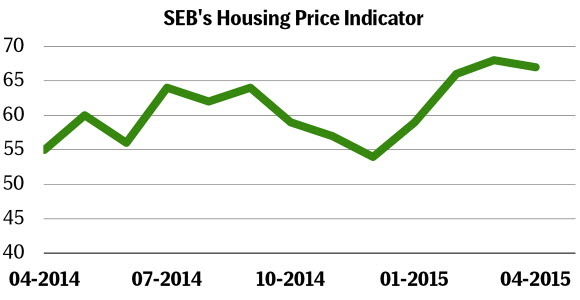 SEB’s Housing Price Indicator clearly suggests that this trend will continue.